3.2 What is the Legal Basis for Risk-Based Closure of Petroleum Sites? The Interstate Technology and Regulatory Council (ITRC) Total Petroleum Hydrocarbons (TPH) Risk Evaluation team has developed this guidance to assist state regulators and practitioners with evaluating risk and establishing cleanup requirements at petroleum release sites. This guidance focuses on factors that are unique to petroleum hydrocarbon releases and builds on other available documents published by the TPH Criteria Working Group (TPHCWG) (1997a, 1997b, 1997c, 1998a, 1998b, 1999), ITRC Risk-3 (2015), Massachusetts Department of Environmental Protection (MADEP) (2014), California State Water Board–San Francisco Bay Region (CASWB-SFBR) (2016a), and Texas Commission on Environmental Quality (TCEQ) (2017b). Complete remediation to generic criteria (e.g., a Tier 1 assessment using default screening levels) or background concentrations at petroleum release sites is often infeasible for technical or economic reasons. Some of these sites that may have levels of indicator compounds below generic criteria could be contaminated in terms of TPH mass. In many cases, states have closed such sites with long-term strategies involving institutional controls (ICs) or by presuming that natural attenuation will continue to weather and break down the remaining petroleum contamination. However, TPH contamination at sites closed where ICs are inadequate or not enforced can cause problems associated with future redevelopment of the site when conditions change and people are exposed to petroleum contamination in soil, groundwater, and vapor containing elevated TPH or if redevelopment requires dewatering and discharge of contaminated groundwater. Better information regarding the benefits and limitations of the different steps required to evaluate risks associated with TPH is needed to help states develop technically defensible methodologies for establishing risk estimates or risk-based cleanup levels and deciding appropriate risk-based corrective actions. This guidance builds on long-standing and current research, presents the current science and understanding of TPH risk characterization, and provides methods and procedures to evaluate risk and establish cleanup requirements at petroleum release sites. This information will assist decision makers in developing and implementing a technically defensible approach to evaluate TPH risk and provides information and supplemental references to assist practitioners in the assessment of fate, transport, exposure, and toxicity of TPH. Furthermore, this guidance provides the practitioner with information that may be used in conjunction with classic tiered approaches for risk-based decision making (ASTM 2015b), including modifications for the assessment and remedial-decision framework for TPH impacts through direct comparison to screening levels (aka Tier 1), site-specific modification of screening levels (aka Tier 2), and complete site-specific risk assessment for sources, receptors, and pathways (aka Tier 3). This guidance is intended to assist in conducting systematic and more consistent human health and ecological risk assessments of TPH contamination of various environmental media. The framework presented in this document would apply to various petroleum mixtures (e.g., crude oils, refined products, petroleum wastes) and can be applied for new release sites or historical release sites where biodegradation metabolites may be present. This guidance applies to sites or to well-defined decision units or operable units within a site for which petroleum hydrocarbons are the primary chemicals of concern. Often, other compound groups (e.g., light nonaqueous phase liquids [LNAPL], polychlorinated biphenyls [PCBs], or metals) may be present and should be addressed through other ITRC guidance documents or federal, state, or local guidance. This guidance will aid in breaking down what the TPH constituents are, explain how they influence risk characterization, and identify benefits/limitations of different approaches to TPH assessment. The use and assessment of TPH data vary widely from state to state and within each state (see States Survey). The regulatory framework section discusses the various regulatory programs that use TPH data and some of their perspectives. This section describes the properties of hydrocarbons that make risk assessment for TPH release sites a unique challenge. Understanding these properties will help develop accurate conceptual site models (CSM) to appropriately evaluate and manage the human and ecological health risks of TPH-contaminated environmental media. Therefore, key topics included in this section are basic concepts of petroleum chemistry and refining, weathering processes, and the definition of TPH for purposes of addressing health risks. This section presents key considerations in addressing petroleum hydrocarbon mixtures at spill and release sites introduced through CSMs. It includes a discussion of CSMs (source, transport pathways, receptors) and specific considerations for petroleum hydrocarbon mixtures. This section also describes data quality objectives for site characterization and risk assessment purposes; presents site investigation strategies, screening methods, and sampling approaches for soil, water, and soil gas; reviews laboratory test methods and recommends general lab testing objectives and specific test methods that meet these objectives; and discusses laboratory data quality assurance and quality control (QA/QC). This information will help the reader plan and conduct field investigations; collect and analyze the samples necessary for risk characterization; and conduct QA/QC on the laboratory data. The information will also help the reader avoid problems that may reduce data quality and generate more uncertainty and errors in risk characterization. This section reviews the fundamental approach to the risk-based TPH evaluation developed by the TPHCWG along with some examples of variations that have been incorporated into or developed under state programs. An evaluation framework that states or entities could follow when developing or revising a program for the evaluation of TPH health risks is presented. The framework builds on a general approach to evaluating TPH, including fractions and polar compounds, and discusses the incorporation of site-specific considerations into the risk evaluation. This section contains guidance to address the uniqueness and challenges associated with conducting an ecological risk assessment (ERA) for TPH. The section describes the ERA concepts, discusses the current state of the TPH ERA practice, and identifies the existing state, national, and international guidance for conducting TPH ERAs. Ecological toxicity of TPH can be both physical and chemical and can vary widely among the different species that may be exposed. Hence, both direct toxicity and the potential for bioaccumulation of some TPH constituents (primarily polycyclic aromatic hydrocarbons [PAHs]) into the food web need to be considered. The effects of petroleum hydrocarbon releases (both short-term and long-term) in aquatic environments have been well investigated, although there is less information on terrestrial environments and on the effects of TPH-related biodegradation products and metabolites. Studies (Albers 2003; USEPA 2007b) have demonstrated toxicity to aquatic and terrestrial species from various petroleum releases. Toxicity testing suggests the toxicity varies with several factors, such as the type of product (e.g., whole crude oil, refined petroleum products, weathered oil, or a subfraction of hydrocarbons), the age of release, increasing transport distance from the release, and sensitivity of the exposed receptor. Although the toxicity in some cases decreases with increased weathering (Salanitro et al. 1997), some studies have shown that the decrease appears to be neither rapid nor steady (CASWB-SFBR 2016b). At sites with ecologically sensitive areas, toxicity testing (see Toxicity Assessment) could be combined with TPH analysis and incorporated into a tiered, multiple-lines-of-evidence approach that could include screening comparisons, toxicity prediction models, and direct toxicity testing for evaluating the threat potential. Water column sediment and soil toxicity testing should be considered, where appropriate; however, consideration of significant weathering of TPH in sediments and soil may need to be considered and should be incorporated into the study design. Not all issues associated with TPH at petroleum-contaminated sites are driven by health-based risks related to direct exposure to contamination. Odor, water quality, water discharge permit limitations, fire/explosion conditions, and other situations can exist. Environmental concerns associated with short-term risks (e.g., vapors from temporary excavations; sheens on runoff from stockpiled soil, etc.) and nuisance (e.g., sheens, odors, tastes, etc.) are collectively referred to in the document as “aesthetic and other short-term concerns.” Under many conditions, the continued weathering/degradation of petroleum contamination can generate methane gas, which in some locations can potentially create safety hazards (ITRC 2014). A more detailed discussion of these concerns is included in the Special Considerations section, and additional information is available in the ITRC LNAPL-3 guidance (ITRC 2018). This section describes means and methods for the estimation of TPH risk concentrations in the various environmental media for exposure by human and ecological receptors. The section provides risk assessment methods promulgated by the U.S. Environmental Protection Agency (USEPA) and several states for forward (a level of risk based on a known contaminant concentration) or backward (acceptable contaminant concentration that meets a specified level of risk) calculations of TPH risk. This section addresses the application of TPH risk assessment to specific stages of a project during site evaluation and remediation, covering the range of initial investigation to post-closure. This section provides information on key topics that are critical in risk evaluation and in developing remedial decisions. The use of historical data and methods for interpretation are also discussed. This section provides information to ensure that all stakeholders have access to the information produced by the larger team so that their participation will be informed by an understanding of the underlying science. Additionally, this section provides approaches to facilitate the communication of the complex TPH risk characterization concepts with a broad range of stakeholders. Through education and workplace roles, all stakeholders will be engaged in this TPH risk characterization process and be able to understand the underlying science of the materials presented in this guidance. The guidance references published case studies. The guidance reviews and provides applications of the concepts and approaches to those case studies. This document is intended to provide the user with technical information to make decisions in evaluating human health and ecological risks associated with TPH at petroleum-contaminated sites. It is not intended for evaluating risk associated with controlled releases and emissions from refinery and industrial facility operations or from storage and handling of petroleum products. The guidance focuses on TPH risk and does not address all issues that may be relevant at a petroleum release site. For example, metabolites found at petroleum release sites are products of biological activity, are more soluble than the parent hydrocarbons, and have significant unknowns relating to toxicology and associated risks that go beyond the scope of this guidance. Although a framework for TPH risk characterization is presented, this guidance is not intended to be a prescriptive methodology. It is recommended for use in the decision-making process along with pragmatic thinking, flexibility, and involvement of qualified professionals and the stakeholders. It is a tool to be used in conjunction with local, state, or federal guidance and regulations applicable to evaluating health and ecological risks associated with TPH exposure. This document does not address policy questions associated with setting remedial goals and objectives, nor does it evaluate the acceptability of different risk management strategies. 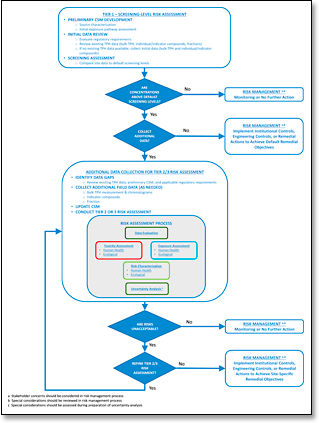 The information provided in this guidance may be used to implement a tiered risk-based decision-making framework to evaluate TPH Risk (Figure 1-1). Each assessment tier requires the development of a CSM; however, refining the CSM will likely be necessary for higher tiered assessments (e.g., site-specific risk assessment). The Tier 1 screening assessment is a streamlined assessment approach often using existing data (typically bulk TPH data and/or indicator compound concentrations) and comparing these results to default screening levels (where available). The Tier 2 and 3 assessments are more site-specific in nature and include an identification of data gaps, collection of additional field data to refine the TPH characterization with either TPH fraction analysis or chromatograms, an update to the CSM, and a more detailed toxicity assessment, exposure assessment, and/or human health and ecological risk characterization. View Figure 1-1 in Adobe PDF format. Figure 1‑1. Tiered TPH risk assessment framework.